Mayo's early exit from the championship last year could have offered some well needed rest for Cillian O'Connor - however all things are local when it comes down to it and Ballintubber's stunning run to a fourth county senior title and a challenge for provincial honours, saw O'Connor's season continue right until the end of November. After Corofin saw off the Abbeysiders in the provincial final, O'Connor went in for surgery on his knee to clean up an issue and it will be later in the spring before we see him in action in green and red. Speaking this week at Eir's launch of their coverage of the National Football League, O'Connor said: "I had a bit of work done on the knee before Christmas. It was just a small enough job, so it wasn't too bad. What I have been at for the Christmas, I have been laid up with that. You can see I'm not too bad moving about the place, moving on the rehab now in the next few weeks to try to get back." Getting his knee looked at is something that he has needed to get done for a while, he added: "It was probably something I've had for a year and a half or so. I was kinda feeling it and it was probably getting progressively worse, but we had a window there after the club to get it done, so we said we may as well." He also pointed out that it is nothing too serious to be worrying about, saying: "It was just below my kneecap. The ligaments were fine, it was just a small bit of wear and tear really that the doc said we should tidy up to get rid of the pain and the pain is gone since I had it. "I just need to strengthen up the area now because there is a bit of wastage around the knee. They are a bit weaker now so it is just about strengthening that for the next few weeks, seeing then what it is like when I go back running." 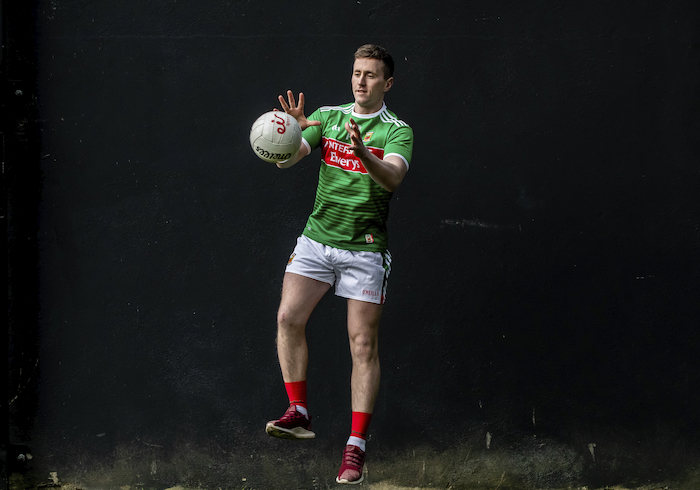 As for his return date to action it's all about waiting and seeing how the rehab goes now, Mayo's all time leading scorer said: "It is a funny one, it will depend on how it reacts to when I go back running towards the end of this month. If it goes well I can train with the rest of the boys in early February and I can look to get playing in the League. Obviously if it is a little bit slower, the reaction to the running, it might be mid to late March. It isn't really defined yet, but we will see." This year sees his club mate James Horan back for another crack at attempting to guide Mayo to glory and O'Connor is positive that Horan will bring something exciting and new back into the group: "He is experienced, he has been there before. He would have managed a club team in Mayo so he would know a lot of the younger players around the county, he would know the older players from his previous stint. He is a character who is always looking to learn, even in his time away he was up-skilling doing different courses and shadowing different teams. I'm sure he has added to his repertoire over his last few months and years. It is exciting now to see what will happen." Not long after his return to the role Horan cast his net wide and far, holding a series of trial games to give as many players as possible a chance to impress him and show they had what it took. While that might have been a surprise to some it didn't surprise O'Connor that Horan embarked on such an exhaustive trawl through the players in the county. "As soon as it was announced that he was going to be manager, the players would have been well aware that there was going to be trials and that they would all be playing. It would nearly have been unspoken and accepted anyway that it would be a clean slate. That is just the way it has to be, the way it should be, the way we want it to be. It was no surprise that everybody was due to line out and to be honest, June 29 we got knocked out so lads were mad to play, to get the boots on."